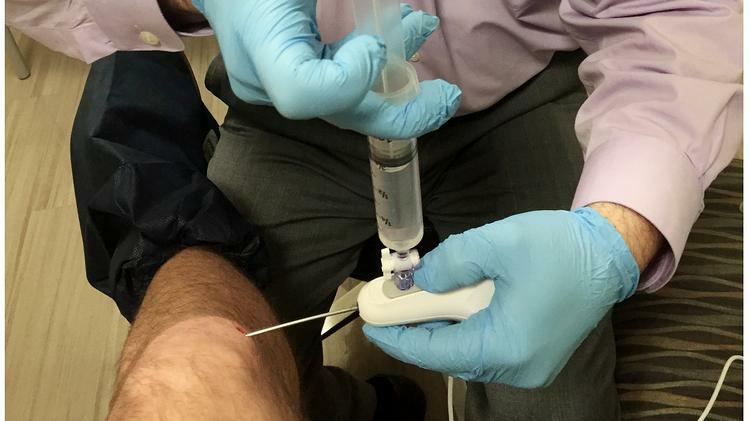 Trice Medical, developer of the mi-eye medical device that allows doctors to diagnose joint injuries in their office, has raised $5 million in a debt financing. The King of Prussia company is seeking to raise a total of $6.3 million through the financing, according to documents filed with the Securities and Exchange Commission. Trice Medical’s mi-eye diagnostic device features a disposable needle with a fully integrated camera to provide illumination and visualization of an interior cavity of the body. The device was created to reduce the need for patients to schedule separate appoints to have an MRI performed to evaluate joint injuries. The company received Food and Drug Administration approval for the original mi-eye device in late 2014. In October of this year, Trice received FDA approval for the mi-eye 2. The second generation device includes improvements that significantly enhance the Mi-eye’s resolution, field of view, depth of field and overall visualization. Jeffrey F. O’Donnell, Trice’s president and CEO, said the company is out raising its third round of equity investments in anticipation of a national launch of mi-eye 2 next year. O’Donnell said he anticipates the total funding process, which will include converting the debt from the bridge funding into equity, to be completed in the first quarter of 2017.